The Bushman's Bar and Point6 socks are the perfect team for all your outdoor adventures. JoJo has worn Point6 socks for over a decade in the North, they are his brand of choice. You have the basics covered if you are traveling with Point6 socks and a Bushman's Bar! Check out the "Super Sock" page on this website and see why JoJo says "Wear The Best or Freeze Like the Rest"! Endorsed by Scott Fraser, a former member of The Canadian Black Jack Ski Team. 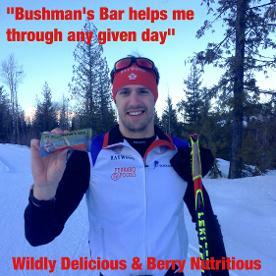 The development of the Bushman's Bar has been supported through joint funding by the Canadian and Saskatchewan governments. Welcome to our website. We are a Canadian company originating in Flin Flon Manitoba, now based in Austin Manitoba. We specialize in creating foods that are gluten-free and taste great. We use ingredients found in the Boreal Forests of Northern Canada to produce foods that are "Wildly Nutritious and Berry Delicious". The Bushman's Bar is now selling online. 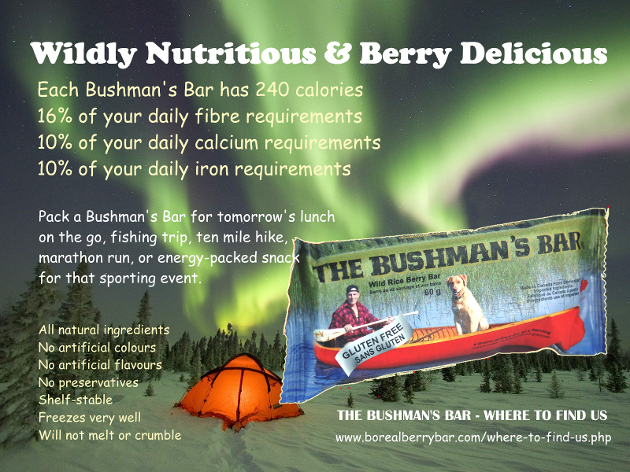 Go to our ORDER NOW Page and treat yourself to a taste of Northern Canada that is "Wildly Nutritious and Berry Delicious"! Wholesale pricing is now available for interested retailers. Please contact Karen at btpain@mymts.net for further information.